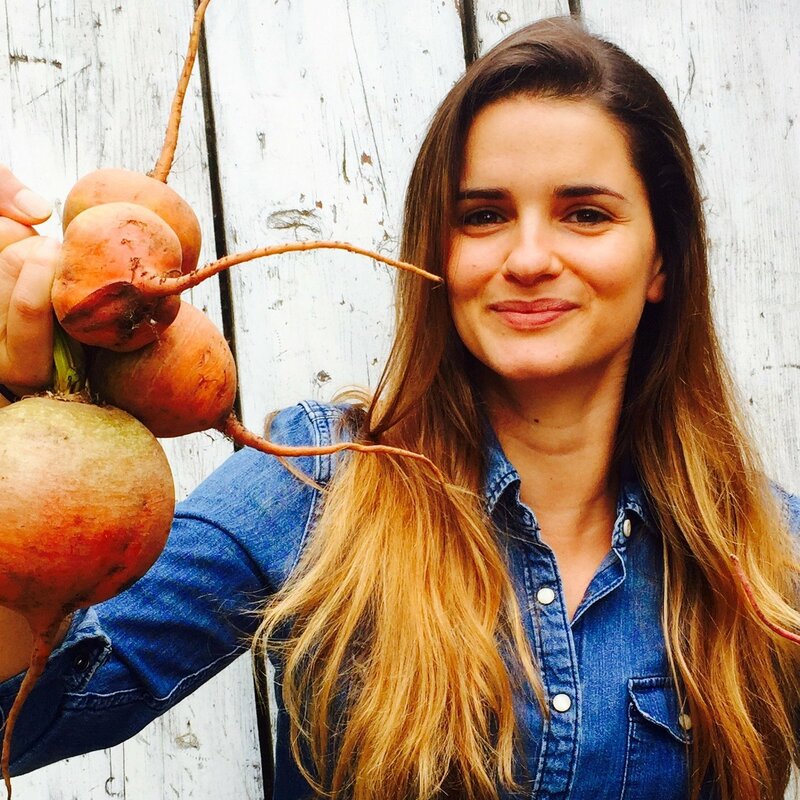 Happy Skin Kitchen – Page 22 – The quest for beautiful skin starts on your plate. Sweet potatoes are by far one of my favourite food! Combine them with creamy quacamole and I am in heaven! 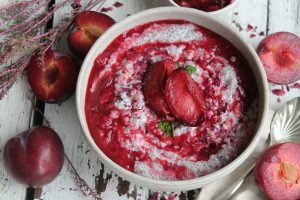 I love how Love Raw Immunity blend adds so much flavours with plenty of incredible goodness too! 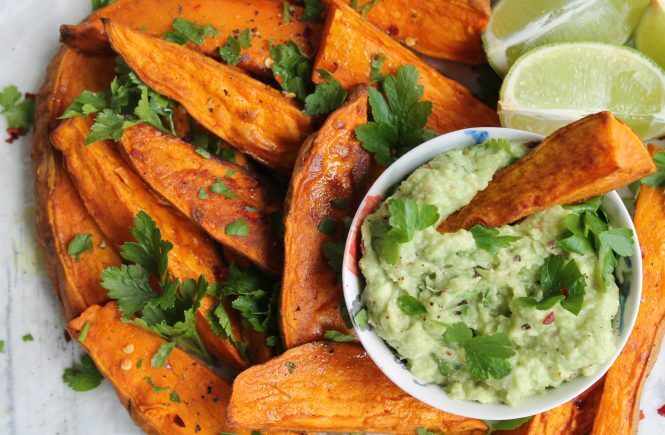 I love how spicy and subtly sweet is which makes it an exceptional seasoning for the perfect sweet potato fries! Wash the sweet potatoes and slice them into large wedges. Place the wedges into a bowl. Pour over the coconut oil, Love Raw Immunity blend, smoked paprika, chilli flakes, salt and pepper. With your hands rub all the spices and oil onto the sweet potatoes until they are all nicely coated. Place all the wedges into a baking tray and cook in the oven for around 30-35 minutes until the sweet potatoes are soft. While the wedges are baking make the quacamole: simply mash the avocado with a fork and add the lime juice, chopped parsley, salt and pepper. Mix everything together. Once the sweet potatoes are cooked served them with the chunky quacamole. These are definitely my new favourite sweet bite. I know I say this a lot but they are just absolute heaven! For the base I have used coconut flour which surprisingly goes very well with the peanut butter flour. If you don’t have coconut flour you can also use ground almond. 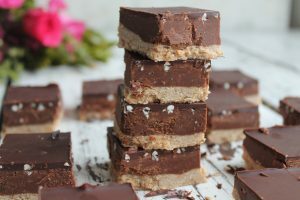 I like the addition of the buckwheat groats into the chocolate layer as they add a nice crunch but you can leave them out if you don’t have them. 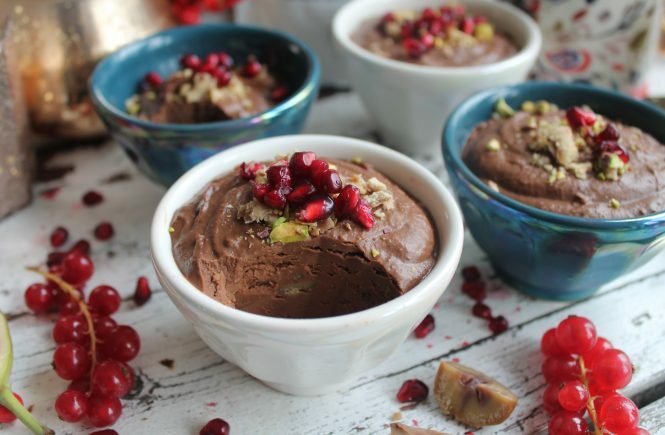 These bites are great to keep in the freezer for when you are craving something sweet, although I warn you that they probably won’t last very long at all! In a mixing bowl mix together the coconut flour, almond butter, melted coconut oil and maple syrup. Stir all the ingredients together. You should have quite a sticky dough when pressed between your fingers. If it still to crumbly add a bit more maple syrup and almond butter. Transfer the mixture into a brownies tin lined with parchment paper. Spread the dough evenly across the tin and press it down with your fingers. Place the tin in the freezer to firm up while you are preparing the peanut butter fudge. Place the peanut butter, coconut oil and dark chocolate into a small pan and put it on a low heat. 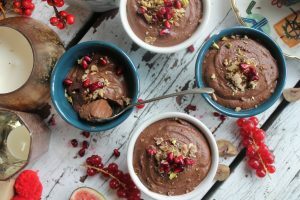 Let the chocolate and the coconut oil melt gently and keep stirring until all the ingredients are well combined together. You should have a smoot and creamy mixture. Remove the tin from the freezer. Pour the peanut butter fudge mixture onto the base. Spread evenly using a spatula or the back of a spoon. Place the tin back in the freezer for at least 1 hour until everything is completely solid and firm. Heat a pan full of water on a medium heat. Cover it with a ceramic or glass bowl. Place the chocolate in the bowl and let it melt gently. Once the chocolate is all melted add in the handful of buckwheat groats if using. Stir again. Remove the tin from the freezer and pour the melted chocolate on top. Shake the tin around so the chocolate cover the all surface. Place the tin back in the freezer for another hour or so until the chocolate is completely solid. 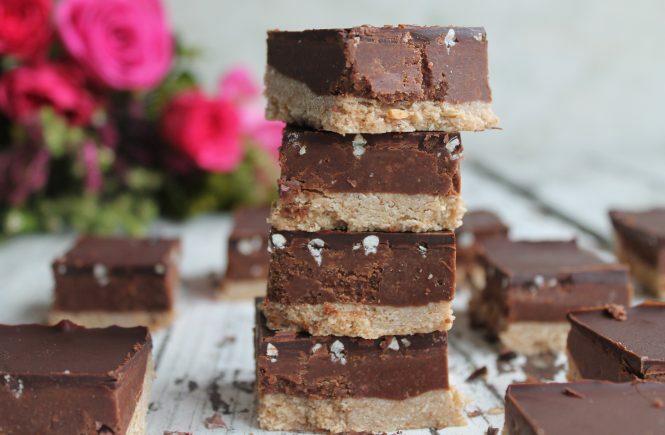 Remove the tin from the freezer ½ an hour before serving, cut into squares and enjoy! Store the bites in an airtight container in the fridge for up to a week. 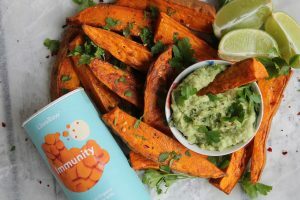 If you have been following for a while you probably know how much I have been obsessed with turmeric, I have literally been having it in everything! 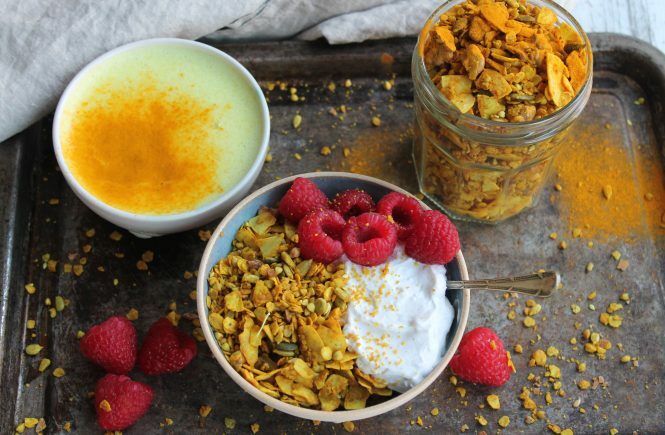 Most people think of turmeric as a spice to have only in savoury dishes, I on the opposite, love using in sweet dishes, like porridge, smoothies and baking. Start by preheating the oven at 150 degrees Celsius. Roughly chop the nuts. You can also use a food processor, just make sure they are not turning into flour, you still want to have quite generous size pieces. 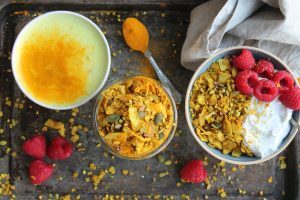 Place the oats, chopped nuts, pumpkin seeds, buckwheat groats, coconut chips, turmeric and ginger powder into a mixing bowl. Pour over the melted coconut oil and the liquid sweeter of your choice. Mix everything well together. Line a baking tray with parchment paper. Spread the granola mixture onto the baking tray using a spatula or the back of a spoon. Bake the granola for 1 hour. Every 15-20 minutes make sure to give the granola a good stir so it will bake evenly. The granola will be ready once it starts to turn into a darker yellow colour. Remove the granola from the oven and let it cooled down completely. .Once the granola has cooled down store it into a hair tight jar for several weeks. 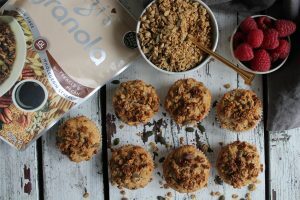 This granola is by far the best granola that I have ever made! It’s perfect for those morning when you need an extra motivation to get out of bed or for those days when you need an extra morning treat. 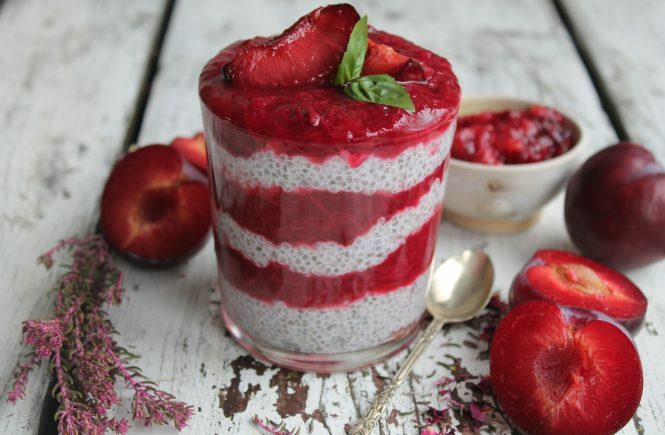 I love serving it with some almond or coconut milk and some fresh strawberries (it makes the milk go all chocolately!) It also makes a great afternoon pick me up when you need something sweet but not too heavy. I personally love adding sultanas or raisin as I love the flavour combination with the cacao, but if you are not a big fan please feel free to leave them out. Place the oats, chopped nuts, sunflower seeds and coconut chips into a mixing bowl. Add the cacao powder, cinnamon and mix everything together. Pour over the melted coconut oil and the agave nectar. Give it a good stir until everything is nicely coated. Line a baking tray with parchment paper. Spread the granola mixture onto the baking tray using a spatula or the back of a spoon. Bake the granola for 1 hour. Every 15-20 minutes make sure to give the granola a good stir so it will bake evenly. This is very important as it will be prevent the granola from burning. 10 minutes before the granola has finish baking melt the dark chocolate. Heat a pan full of water on a medium heat. Cover it with a ceramic or glass bowl. Place the chocolate in the bowl and let it melt gently. Remove the granola from the oven and place it into a mixing bowl. Add the sultanas (if using) and give it a stir. Transfer the granola into a mixing bowl and pour over the melted chocolate. Mix everything again. 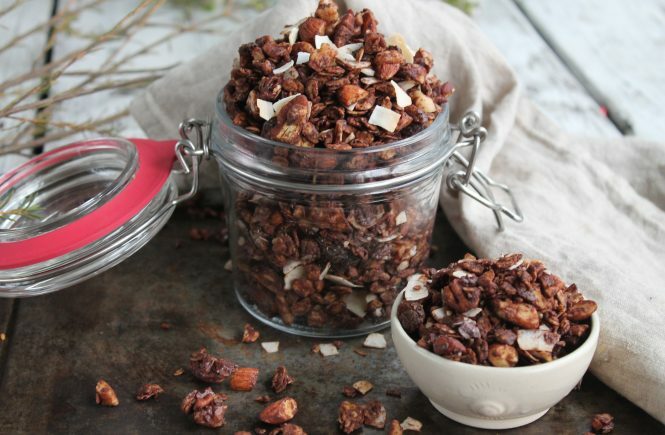 You want to try to coat as much as possible the granola with melted chocolate. Spread the granola once again onto the baking tray covered with the parchment paper and let it cool for at least 1 hour until the chocolate has solidified. Store the granola in an air tight jar for few weeks. After visiting Vietnam a couple of months ago I completely fell in love with one their most popular dish, Pho. Normally Pho is based around a bone broth and normally served with seasonal veggie, chicken or beef. 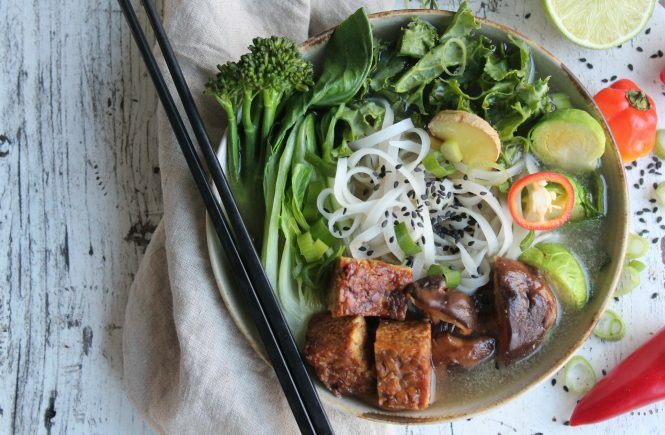 My version is made with a rich veggies and mushrooms stock and served with meaty sticky tempeh chunks. I love how warming, comforting and filling this dish is without being too heavy. Ideally you want to make your stock in advance so you can just throw some veggies and the tempeh in and your meal will be ready in no time! If you can’t find tempeh sliced tofu will work perfectly as well. Start by making the stock. I personally prefer to make the stock on Saturday or Sunday when I have got plenty of time (for best results is better to let the stock simmer for at least 5 hours) so I can enjoy a hot bowl of pho throughout the week. Roughly chop the onion, garlic, chilli and ginger. Into a big pot heat up 1 tablespoon of coconut oil. Once melted add the chopped onion, garlic, chilli and ginger. Sautee for about 5 minutes until the onions are starting to turn golden brown. Add all the other veggies plus the 2 litres of filtered water. Bring the stock to boil them turn the heat down to a simmer. Put the lid on and let it cook gently for 4-5 hours. Once the stock is ready adjust with salt and pepper. Strain all the liquid to a fine sieve. Discard the cooked veggies (unfortunately because they have been cooked for so long there isn’t much goodness left in them to do anything with!). Store in stock in a jar or an airtight container. Slice the tempeh into generous bite size pieces. In a frying pan heat up one tablespoon of coconut oil. Once hot add the tempeh and let it cook onto 1 side for a couple of minutes until it starts to brown. Keep turning the tempeh pieces until they are evenly golden brown. Add the tamari sauce and cook for another couple minutes. Finally add the agave nectar and toss the tempeh pieces around so they all get coated. Turn the heat off and let the tempeh rest in the pan. To make your pho. In medium size pot pour about 3 cups of your veggie stock. Bring it to boil. Add the rice noodles, chopped kale (or the greens you are planning to use), packchoi, chopped mushrooms, spring onions, sliced ginger and fresh chillies. Let it simmer on a medium heat for about 5 -7 minutes until the veggies arte tender and the noodles are cooked. Serve in bowls with the sticky glazed tempeh, fresh coriander, sesame seeds, a squeeze of lime and a splash of tamari sauce. 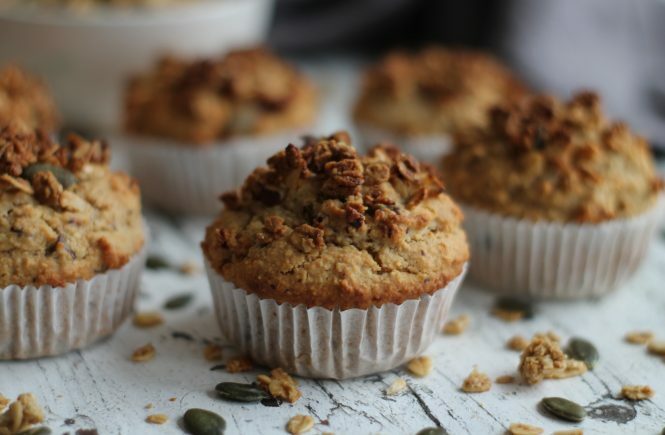 These muffins are the ultimate guilt free treat! Although they are completely gluten free they are still super fluffy and moist I love how the Liz’s granola adds such a lovely crunch! They are the perfect afternoon pick me up or they also make a great breakfast on the go. I always been a fan of making my own granola. 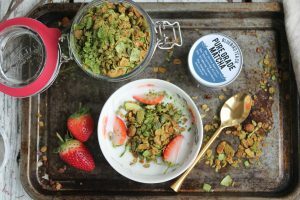 However I was a little bit hesitant when I made the first batch of this Matcha Green Tea granola as I wasn’t sure how the normally quite bitter Matcha powder would have worked with the other ingredients. It turned out to be better than I could ever imagined! I love how the earthiness of matcha goes so well with the sweetness of the maple syrup and sultanas. The delicate flavour of coconut chips goes also so well with the slight bitterness of the Matcha. All in all this is officially my new flavoured granola! I love serving it with fresh berries and coconut yogurt but even with just a splash of any milk of your choice would be utterly delicious. It’s also a great breakfast for those sleepy morning when you need an extra boost of energy to start your day. Place the oats, chopped nuts, pumpkin seeds, flaked almonds and coconut chips into a mixing bowl. Pour over the melted coconut oil and the liquid sweeter of your choice. Mix everything well together. Line a baking tray with parchment paper. Spread the granola mixture onto the baking tray using a spatula or the back of a spoon. Bake the granola for 1 hour. Every 15-20 minutes make sure to give the granola a good stir so it will bake evenly. The granola will be ready once it will turn into a nice golden brown colour. Remove the granola from the oven and place it into a mixing bowl. Add the sultanas and give it a stir. Add in the matcha powder and mix again. 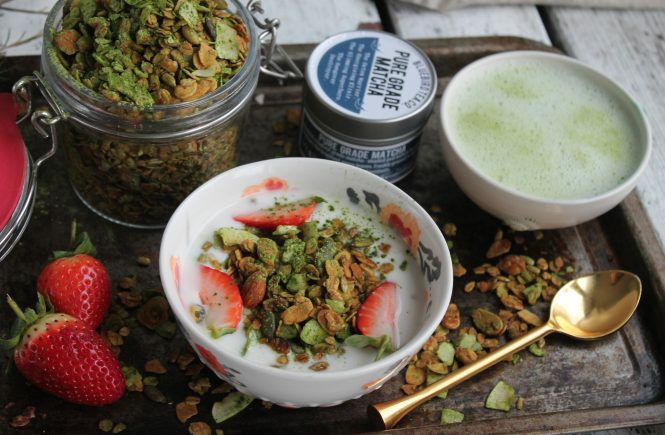 You want to try to coat as much as possible the granola with the matcha powder.I find it easier to use my hand to mix everything together. Once the granola has cooled down store it into a hair tight jar for several weeks. 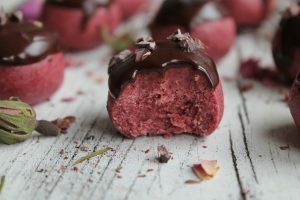 These little truffles are literally bites of heaven! 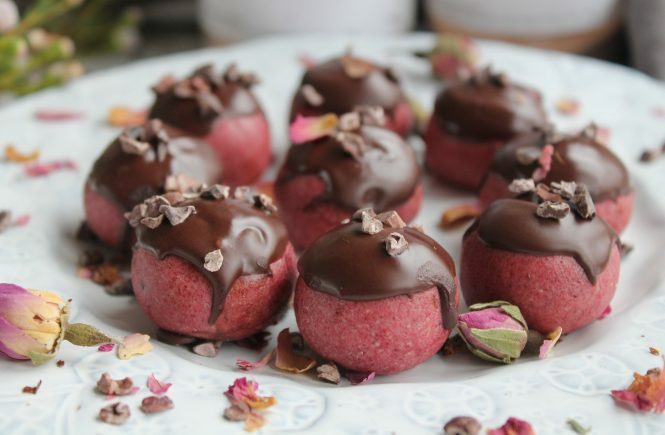 Apart from looking incredibly pretty they are packed with skin loving antioxidants thanks to the raspberries powder and with amazing plant protein thanks to Pealicious vegan protein powder. They are super easy to throw together and they make a great gift to bring to a dinner or birthday party. Place the cashews into a food processor and let it blitz for 7-10 minutes until they start to turn into a buttery paste. It almost need to resemble shop store cashew butter. Make sure to scrape the sides from time to time to make sure everything get blended well. While the cashews are in the food processor melt the cacao butter. Heat a pan full of water on a medium heat. Cover it with a ceramic or glass bowl. Place the cacao butter in the bowl and let it melt gently. Add the melted cacao butter and all the remaining ingredients to the food processor and blitz for a further minute until everything is well combined. You should have a relatively sticky, firm dough. Roll it into balls and place them in the fridge to firm up for at least 2 hours. Remove the balls from the fridge and dip them into the melted chocolate. Sprinkle them with cacao nibs (optional) and let them cool for at least 1 hour. Enjoy! Store them in the fridge in an airtight container for up to 2 weeks.